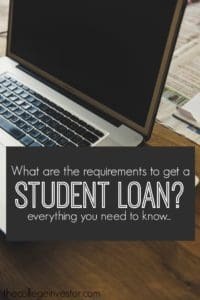 Home » What Are The Requirements To Get A Student Loan? Not necessarily. While the requirements to receive student loans aren’t particularly restrictive, there are certain criteria you must meet before being considered. This is different at the federal and private level, but just about any loan you receive during your lifetime will have some hoops to jump through first. In fact, any lender giving out loans without restrictions is probably predatory – and probably best avoided. Looking to see if you qualify for federal or private student loans? Read on to get started. It can be tough to understand the difference between subsidized and unsubsidized student loans. Only students whose FAFSA shows financial need can receive subsidized loans, which don’t charge interest while still in school. Students who defer their loans also don’t have to pay interest during that time. Students who fill out the FAFSA and don’t meet the requirements for “demonstrated financial need” can receive unsubsidized loans, which levy interest during the semester and the six-month grace period following graduation. Parents can take out unsubsidized PLUS loans for any dependents, for the total cost of attendance excluding other loans or scholarships the child has received. Each private loan servicer has different requirements, so it pays to shop around to find the best deal. Most require a minimum income and credit score before they’ll agree to lend to you. That’s why private loan borrowers often need a cosigner, because college students typically have no income or credit history. We recommend comparing your private student loan options with a service like Credible. Credible allows you to compare multiple lenders in minutes, without doing a hard credit check. Again, be wary of any private lender with no restrictions or criteria to meet. For instance, lenders who will sign off on a six-figure loan without adequately verifying your value as a loan recipient should probably be avoided. In other words, if it sounds too good to be true – it probably is. I flunked all my classes my first semester of college and had to take a break from school to get my life together. Now im ready to give it my best shot but cant pay for my classes. What do i do? My daughter just found out she is not able to get student loans because she has to many education credits. What does that mean? Never heard of such a thing. You should ask her for the letter/email denying her and see what it actually says. Do you have to have any kind of income to get student loans? Depends on the loan. Definitely not Federal loans. Private loans will likely require a cosigner without income. And almost all student loan refinancing will require solid income and debt-to-income ratio. My son needs a private loan to help pay for off-campus housing. Will he know how much he qualifies for when he fills out the application online? How long will it take to get a disbursement, not until school starts? Yes, he will know immediately. And the disbursement won’t occur until the school certifies enrollment (which is usually about 1-2 weeks before classes start).